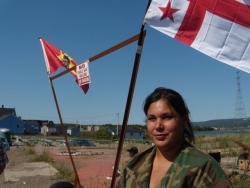 AULD'S COVE, NS—Mi’kmaq people from Cape Breton and the Nova Scotia mainland are preparing to set up a “partial blockade” of the Trans-Canada Highway in Auld’s Cove, on the mainland side of the Canso Causeway, the access point to Cape Breton. "We’re going to be slowing the traffic down to a bare stop," said Ginny Marshall, pipefitter and mother of four from Potlotek (Chapel Island) on Cape Breton. "But we’ll be allowing people to go through," while handing out information and pamphlets, she explained. 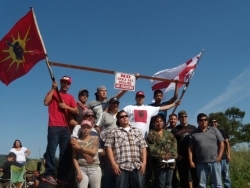 "We have to make it known why water is sacred." Mi’kmaq communities—and many non-Indigenous residents around Lake Ainslie—have been clear in their opposition to exploratory drilling around the watershed, saying that no amount of money is worth risking the pristine water resources that Lake Ainslie supports. "I’m a pipefitter and I would benefit from this type of job," said Marshall, referring to the development the province says is necessary to the economically depressed region. "But...I’ve seen all the damages that it does...I cannot tell my children, my child...I didn’t try. I let this go. I knew they were going to destroy the water...and money was too important." "I don’t know if you’re familiar with the 1752 treaty, [which was affirmed in the 1999] Marshall Decision, where we’re allowed to hunt and fish. So they thought about us 300 years previous. That’s how strong that treaty was," said Peters. "So now what we’re trying to do is leave something for our children...maybe all it could be is fresh water." "We’re going to put up a teepee and we’re going to have a fire, drummers are going come in and drum, sing the honour song and we’re going to have one of our elders say an opening prayer just so everything goes good," said Peters yesterday. "We’re leading, but it’s for all human beings." "We’re trying to do this as peaceful as possible," said Marshall. But she, Peters and Bernard added that they will not give up if the partial blockade doesn’t affect the changes they are looking for: a complete halt on any oil and gas exploration or drilling at Lake Ainslie. "If they do drill that [exploratory] well, what’s going to stop them from fracking?" said Paul. "It’s going to cost them millions of dollars to drill that one hole. And just leave it? I don’t think so." "We will take your time...we understand your time is your money," said Marshall. "If no other way is gonna put a stop to this, this is our last resort." "We’re so lucky to have a place so safe in the world compared to other places," said Marshall. "Blue gold is going to be the next commodity...just like oil, it’s gonna be our water, because water is a key element to life."